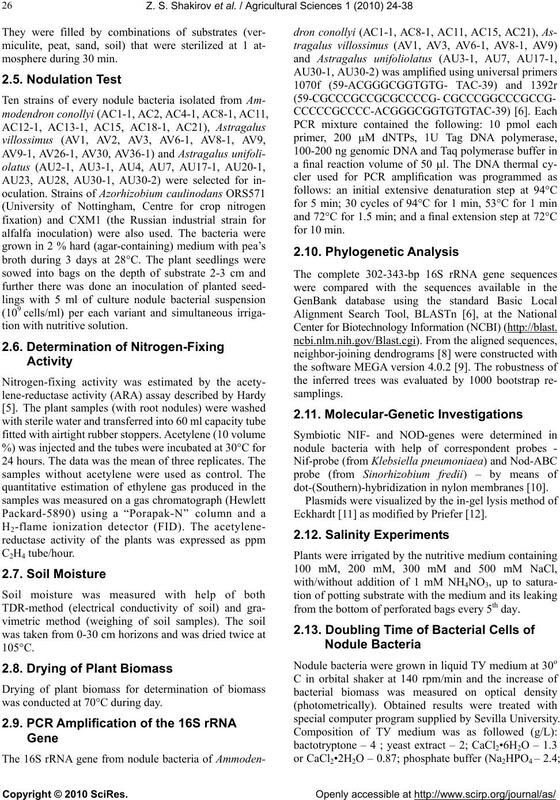 Received 27 April 2010; revised 3 May 2010; accepted 5 May 2010.
nitrogen-fixing symbiosis with the host plants. bium, Burkholderia and Achromobacter genera. plant s grown in non-salted conditions. of combating desertification is actual for many countries. 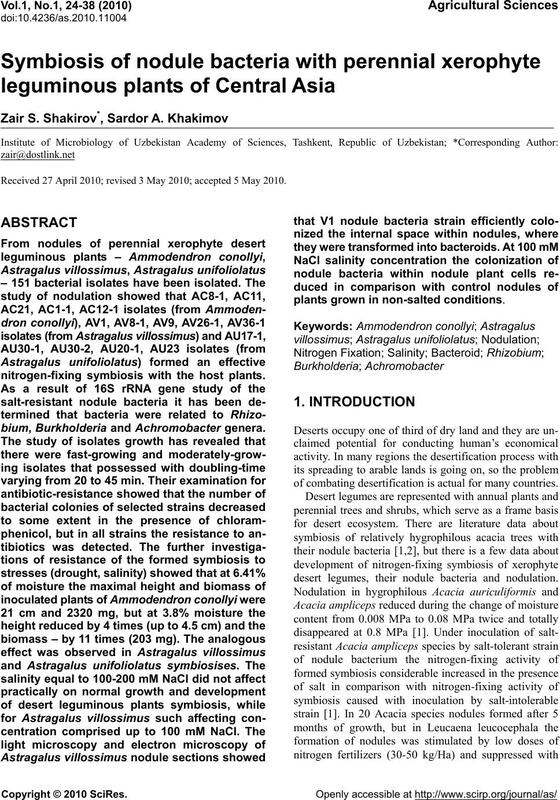 desert legumes, their nodule bacteria and nodulation. in Acacia trees at 150 mM NaCl . their symbiosi s to st resses (salinity, drought). height 2-3 m and maximal height – up to 8 m .
they are fluffy and white . length, cylindrical, closely twisted, white . for formation of ascend ing flow of th e nutritive solution . perforated bags (vegetation experiments) were used. was conducted at 70°C during day. Center for Biotechnology Information (NCBI) (http://blast. dot-(Southern)-hybridization in nylon membranes . Eckhardt  as modified by Priefer . from the bottom of perforated bags every 5th day. special computer program supplied by Sevilla University. 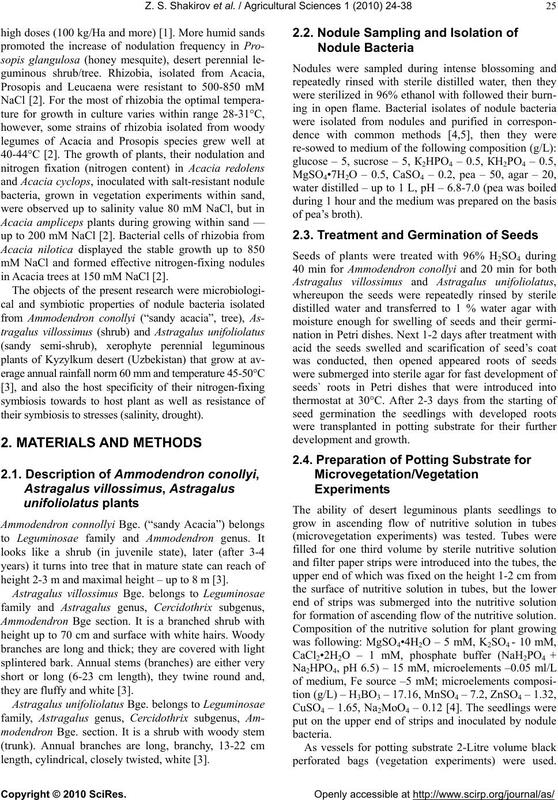 KH2PO4 – 1.0), H2O – up to 1 L, pH – 6.8-7.0 .
from perennial leguminous plants of Kyzylkum Desert. by 3 times, but growth of C21 strain was extremely slow. strain, all the rest strains grew in agar at 8°C (Ta ble 2). NaCl. Cultures were maintained in an orbital shaker at 30oC. (a) Doubling time; (b) td: td of control; (c) No detectable growth. 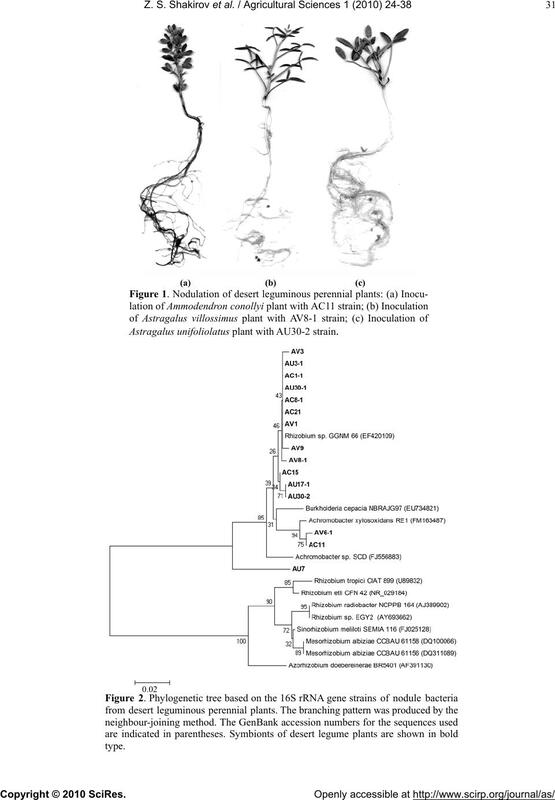 AV(3) – nodule bacteria isolated from Astragalus villossimus nodules. Table 2. Relevant characteristics of the isolates described in previous. (a) Doubling time in TY liquid medium at 30°C. 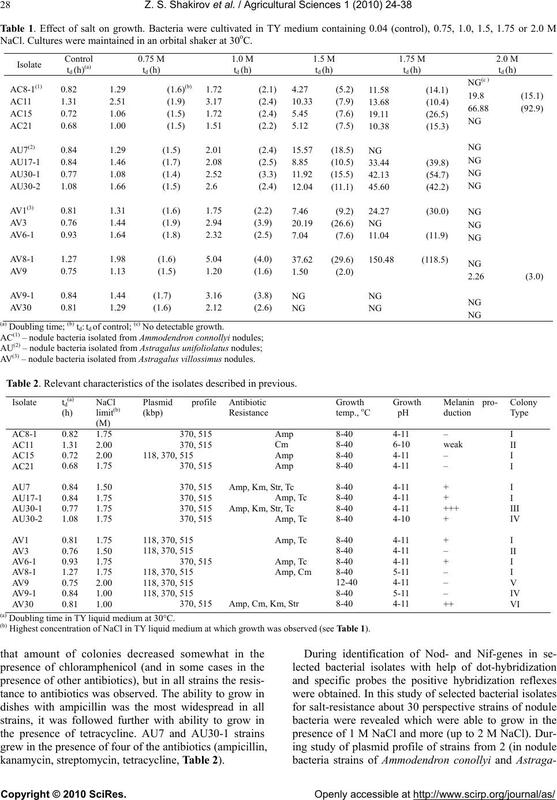 (b) Highest concentration of NaCl in TY liquid medium at which growth was observed (see Table 1). kanamycin, streptomycin, tetracycline, Table 2). 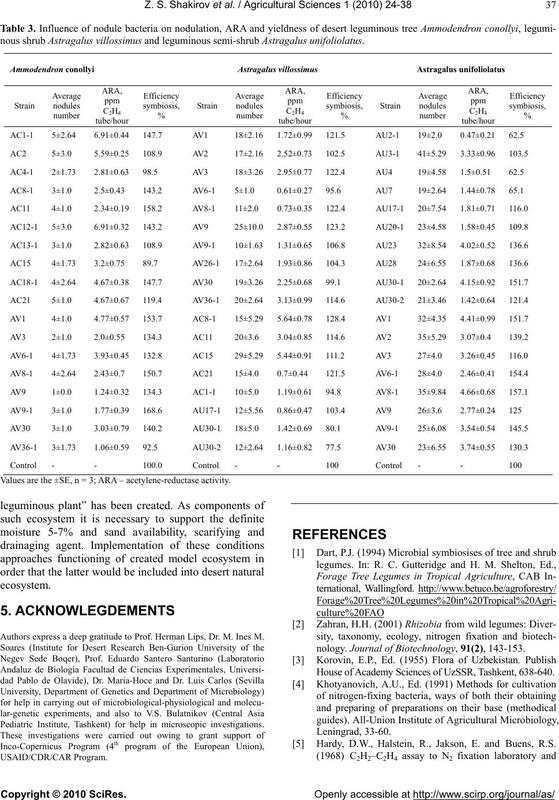 118, 370 and 515 kB correspondingly (Table 2). also help in identification of closely-related rhizobia. they were considered lik e as Mel–strains (Table 2). Type 1: Middle size, round, convex, light and white. Type 4: As type 1 , but smaller in sizes. Type 5: Middle size, round, dim and curly. become darker than type 3. (strains) of nodule bacter ia. 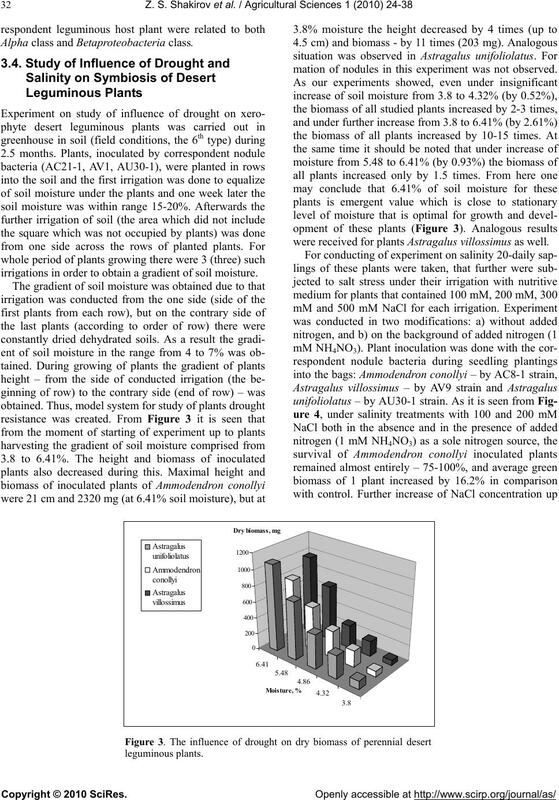 and study of root nodul ation of t he grown up plant s.
tion for plants in pots (0.7 L) in greenhouse. 1 part vermiculite: 1 part soil: 2 parts sand. parts sand: 1 part vermiculite. 5) Natural conditions (fine-grained sand). ture exceeded the transpiration of water by desert plants. intense growth and development of plants was observed. ducted in sand, the 5th type of potting substrate. AV8-1, AV9 and AC8-1 strains. Astragalus unifoliolatus plant with AU30-2 strain. Alpha class and Bet aproteobacteria class. irrigations in order to obtain a gradient of soil moisture. mation of nodules in this experiment was not observed. were received for plants Astragalus villossimus as well. decreased up to 25 and 50% accordingly (Figure 4). minous plants (in the presence of nitrogen source). 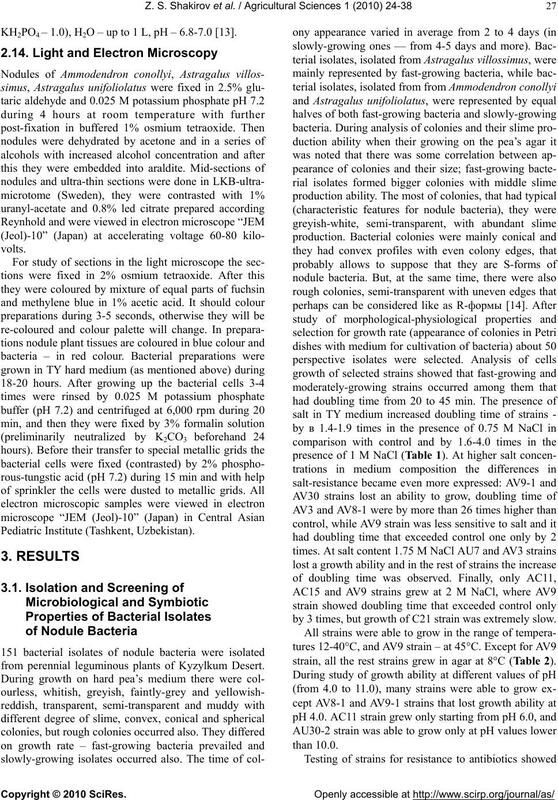 by bacterial cells of nodule bacteria. internal spaces reduced practically (Figure 6(h)). and 200 mM NaCl (h). varied – from roundish to rectangular (Figures 7(d)-(i)). 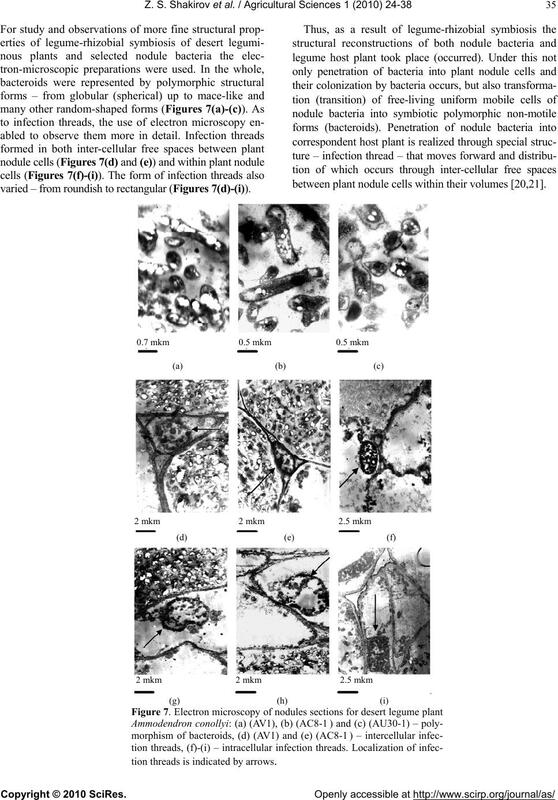 between plant nodule cells within thei r volum es [20,21]. tion threads is indicated by arrows. AC18-1, AC8-1, AV1, AV3, AV9, AU23 and AU30-1. 3rd megalpasmid, they do not form nodules in alfalfa. nous shrub Astragalus villossimus and leguminous semi-shrub Astragalus unifoliolatus. Values are the ±SE, n = 3; ARA – acetylene-reductase activity. Authors express a deep gratitude to Prof. Herman Lips, Dr. M. Ines M.
Pediatric Institute, Tashkent) for help in microscopic investigations. nology. 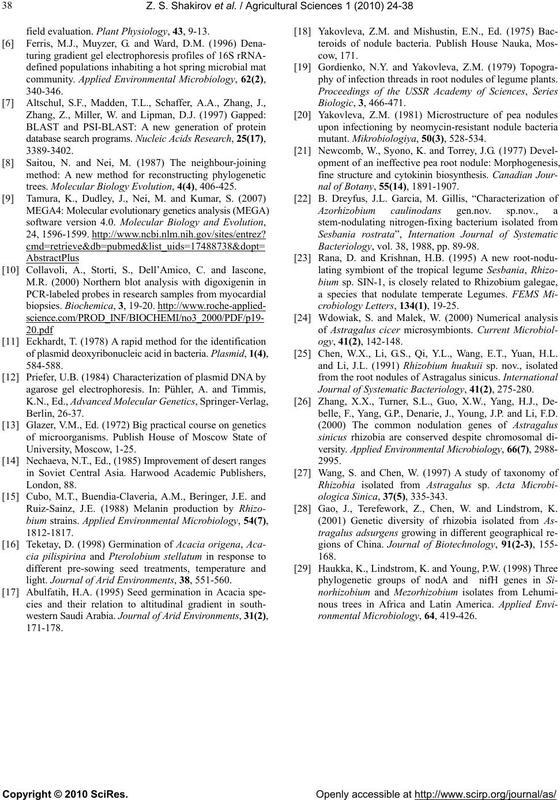 Journal of Biotechnology, 91(2), 143-153. House of Academy Sciences of UzSSR, Tashkent, 638-640. Hardy, D.W., Halstein, R., Jakson, E. and Buens, R.S. field evaluation. 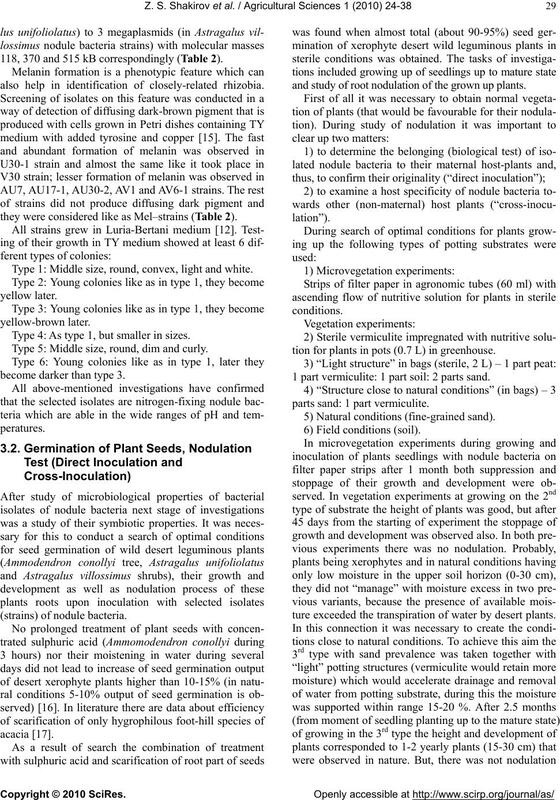 Plant Physiology, 43, 9-13.
trees. 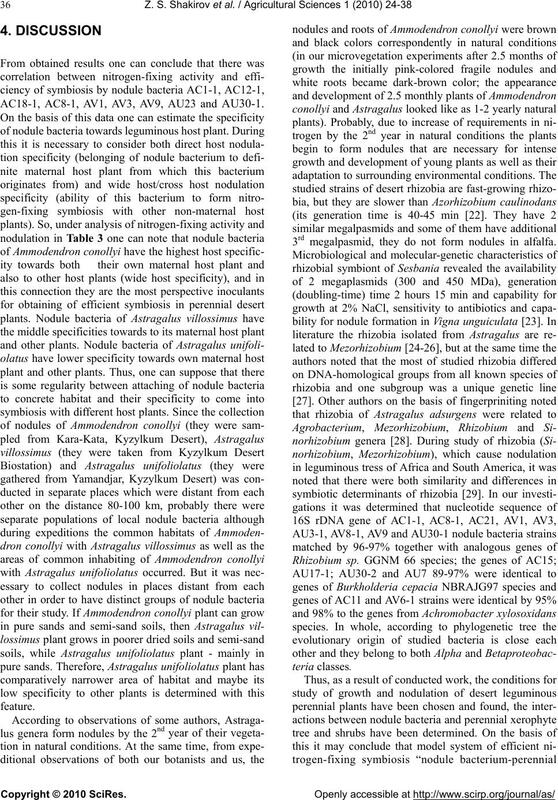 Molecular Biology Evolution, 4(4), 406-425.
light. 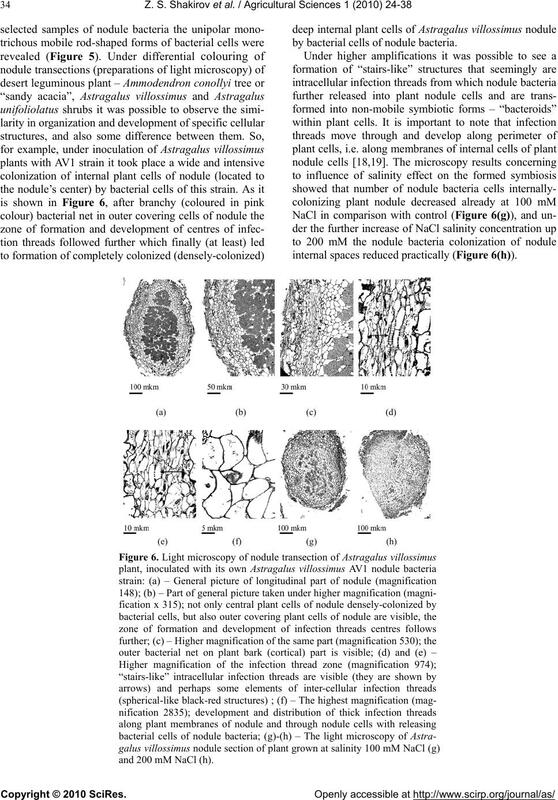 Journal of Arid Environments, 38, 551-560.
phy of infection threads in root nodules of legume plants. nal of Botan y, 55(14), 1891-1907. 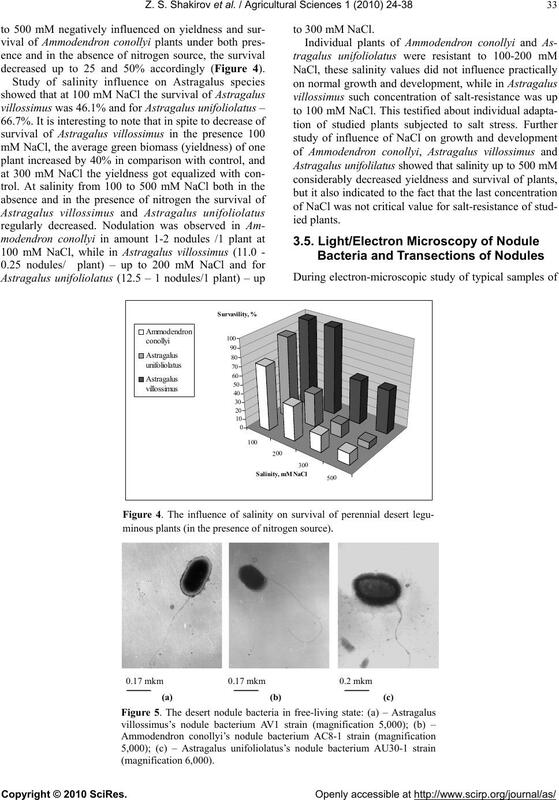 Bacteriology, vol. 38, 1988, pp. 89-98. Chen, W.X., Li, G.S., Qi, Y.L., Wang, E.T., Yuan, H.L. 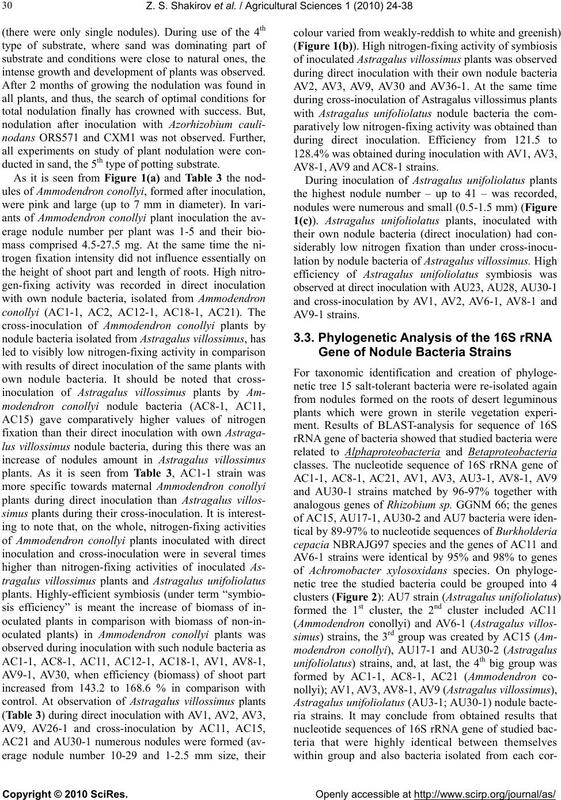 Journal of Systematic Bacteriology, 41(2), 275-280.
belle, F., Yang, G.P., Denarie, J., Young, J.P. and Li, F.D. Gao, J., Terefework, Z., Chen, W. and Lindstrom, K.